SW Forklift Training and MEWP Training Newport Gwent South Wales. Offering affordable on site forklift training and mobile elevated work platform (MEWP) Training throughout Newport Gwent and the Whole of South Wales. Keeping prices low to offer exceptional professional service at prices all businesses can afford. We are a local business based in Newport and sub contract to several of the biggest industrial training agencies in the UK. We keep our costs low by being a home based business, keeping our overheads low and passing those savings onto our clients not just in Newport but across South Wales, The West Country and The West Midlands. 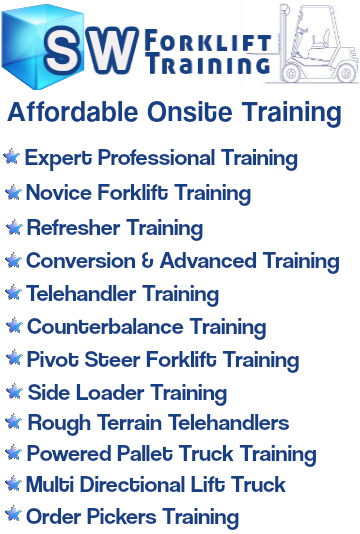 Forklift Training Why do I need my Forklift Truck Operators Competently Licensed? Forklift Training Is Essential For Safe And Competent Operations. Forklift Trucks are essential in many building, distribution and warehousing operations. Flt training onsite both improves confidence in your employees and improves productivity whilst reducing the possibility of accidents at work. This in turn can have the effect of reducing employer liability insurance premiums as insurance companies rate forklift safety training as a major factor when considering premiums. With the emergence of various forklift truck based machines it is essential to ensure that all operatives are fully trained in the correct safe operation of all machinery. It must be made clear that every employer has a duty of care to ensure that any person operating any machinery from a simple pallet truck to more complex counterbalance or long reach pivot machine is properly trained and certified. There are legislative penalties enforced by the Health and safety executive, which are enforceable on manager’s right up to directors and owners of businesses that could if an accident occurs through inadequate training, result in prosecution with penalties ranging from fines through to imprisonment depending on the severity of the accident and or negligence involved. Many workers are also prone to danger especially if they do not know what they are doing. As an employer, you have a duty of care to ensure the safety of all of your workers. Operating this kind of machine requires the correct knowledge and expertise on how the machine works and also the safety procedures that must be adhered to at all times. Forklift Training Helps To Prevent Accidents And Increase Productivity. Most accidents with forklift trucks result in pedestrian injury or in extreme cases even death, whilst forklift operators can and do injure themselves through irresponsible operation, more often a co worker is the casualty through poor care when operating the forklift truck..
Once a Forklift truck is involved, risks are apparent that can affect the safety of the operator and anyone in the immediate vicinity of the forklift truck. It is imperative to any business that a forklift truck operator is correctly certified by a competent registered forklift truck operator trainer such as SW Forklift Training. It is also the responsibility of each business to ensure that forklift truck operators are fully competent, safe and have the correct training applicable to the machine that they are operating. Another thing is to set in the minds of your workers not to play with the forklift truck. It must only be used for work and they must not put themselves or their colleagues in any danger by playing or misuse in the workplace. Once the forklift truck operator is ready, it is also the employer’s responsibility to ensure that the forklift truck itself is properly maintained and safe to use. Forklift operation safety must be your priority so that employees are not placed in danger, and properties not damaged. Our Onsite Forklift Training is Delivered By Nationally Registered Instructors. Our training is fully compliant with the HSE code of practice L117. We specialise in Forklift Training in Newport as Newport is our home City, working from a home office we are able to offer affordable forklift truck training across Wales, The West Country and The West Midlands. Forklift Training in Newport is especially affordable as it is on our doorstep, giving even greater savings in overhead costs, these increased savings are passed directly to our customers in Newport and Cardiff. Onsite Flt and MEWPs training from an experienced ex British Army training specialist. We specialise in Onsite Training from a home based business, keeping overheads down whilst giving you the Best Price Guaranteed on Forklift and MEWPs Training in Newport, Cardiff Bristol Wales, The South West and The West Midlands. For Forklift Training in Newport and Mewps Training in Newport, SW Forklift Training are The Local FLT Trainers to You Covering Wales, The West Country And The West Midlands.